Submitted by lynn on Monday, May 12, 2014 - 8:23am. The lunch gang decided to eat at Chaba Thai one week so of course I was down for this new Thai place! I drove separately and was running late so I rushed into the restaurant and told the waitress by our table that I wanted Pad See Ew. But then, she brought out a notepad and began TAKING our table's orders. Oops, I guess they hadn't ordered yet! What threw me off was that they already had soups and salads in front of them and mine happened to be arriving at the same time we were ordering! So let's get into the lunch special details. 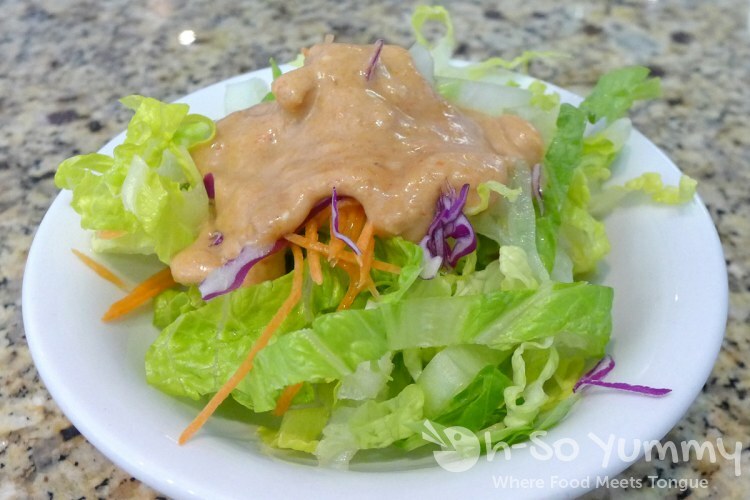 The simple green leaf lettuce and carrot salad came with peanut sate as dressing. I did like the taste of the peanut sate but thought it was too strong for a salad. I'm sure it pairs excellently with chicken though! 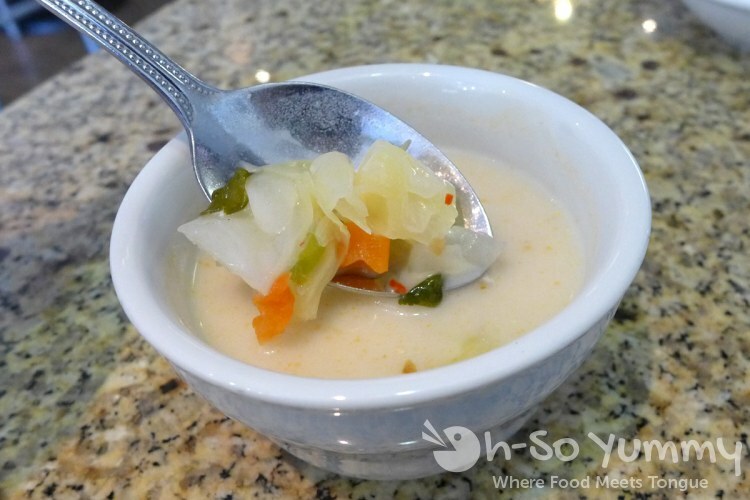 The sweet and sour coconut soup was a little better and I enjoyed the savory broth with the tender cabbage and other veggies. 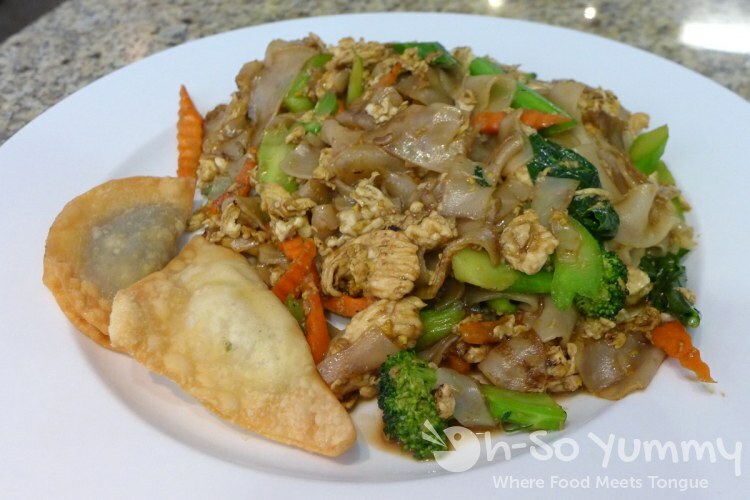 The Pad See Ew with chicken finally arrived. It actually came out too hot and I had a little trouble eating it because I was starving yet it was burning my mouth! Also, I felt as if the noodles were too soft and that there was an extremely high proportion of egg in this dish. The vegetables were normally cooked and had a mix of regular broccoli AND a chinese broccoli. The pieces of chicken in this dish were the smallest out of the Thai places I've recently reviewed (including Thai House Cuisine and Spices Thai) but didn't really stick out much. Overall, I thought the dish was a bit flat and needed some more seasoning. It also came with an empanada and fried wanton which weren't that crispy and not too exciting. After lunch, I didn't feel completely full but no grumbly stomach before dinner means that it was enough for me. If it were based off my one dish, I wouldn't come back, but I believe my coworkers enjoyed their dishes so I would definitely order something else like one of their curries if there was a next time. Dude, that DOES look like there's a crazy amount of egg in it. Weird. Maybe they were just having an off day. Did you little appetizers taste any better? Yea, I remember how much you love eggs... This wouldn't be for you because it's so eggy! I want to give Chaba Thai a second chance on their other entrees but when you include the mostly lackluster appetizers, I'm jumping ship to try the multiple other thai places in convoy before a revisit.